Maine Sports Media: ESPN Sportsnation Poll, Can You Spot the Error? 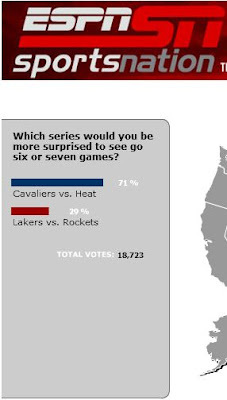 ESPN Sportsnation Poll, Can You Spot the Error? Did Miami contest the Game 7 result from yesterday or something? Was this poll made on Saturday? Did an intern fall asleep at the wheel? They have since taken the poll down and fixed the error on the original. You can see the full poll in all it's glory below..